TSA has had a tough existence - from pat-downs to leaked photos to overlooked guns and knives. Finally, something to feel good about. I might even go so far as to say “soft and fuzzy” warm about. Next time you are in Cleveland Hopkins Airport, look around and you might see one of Dolan’s cousins – the explosive sniffing dogs of TSA. So who is Dolan? He’s the 500th puppy to be bred into this successful program of the TSA. Based out of Lackland Air Force Base in Texas, the dogs are bred to assist with something no human can do – sniff explosives. Each puppy is then named in honor of a 9/11 victim. Dolan has been named after Capt. Robert Edward Dolan Jr. who was one of the victims at the Pentagon crash site. Capt. Dolan, quite fittingly, was an explosives expert who was working with Homeland Security in the Pentagon at the time of the terrorist attack. The naming of this 500th puppy seems so very appropriate, and his wife was touched by the remembrance. Since 2002, dogs have been trained for this work and then sent around the country to airports and other mass transit locations. But, before the dogs are actually brought into the training at a year old, they are raised by volunteers throughout central Texas. The families raise the dogs from 10 weeks until about 12 months. TSA provides the food, equipment and veterinary care. 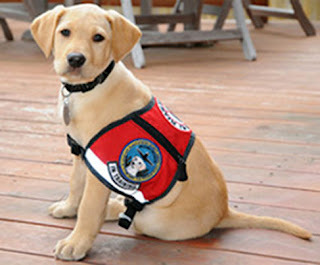 The TSA would like to increase the program to 200 dogs per year if it could find additional volunteers. For more information, see the video or go to TSA.gov or call them at 210-671-1624.